Anna Maria Tremonti of CBC’s The Current today interviewed Nate Hendley and Ron Moffatt about Nate’s new book, The Boy on the Bicycle. 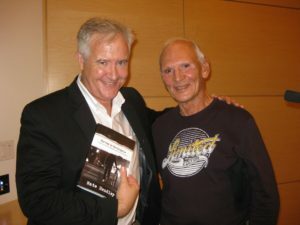 Ron spoke candidly about his horrific experience in the 1950s at the hands of bungling police officers bent on coercing a confession out of him, for a murder he did not commit. What is truly frightening is police have the same latitude today. And it is for that reason Ron has broken his long silence. Nate Hendley was pleased to give voice to Ron’s story, and after three years of exhaustive, investigative research, completed that story with the release of The Boy on the Bicycle. The interview and CBC’s story can be found here. The book, in both print and ebook can be acquired directly from Five Rivers, or through your favourite online bookseller.